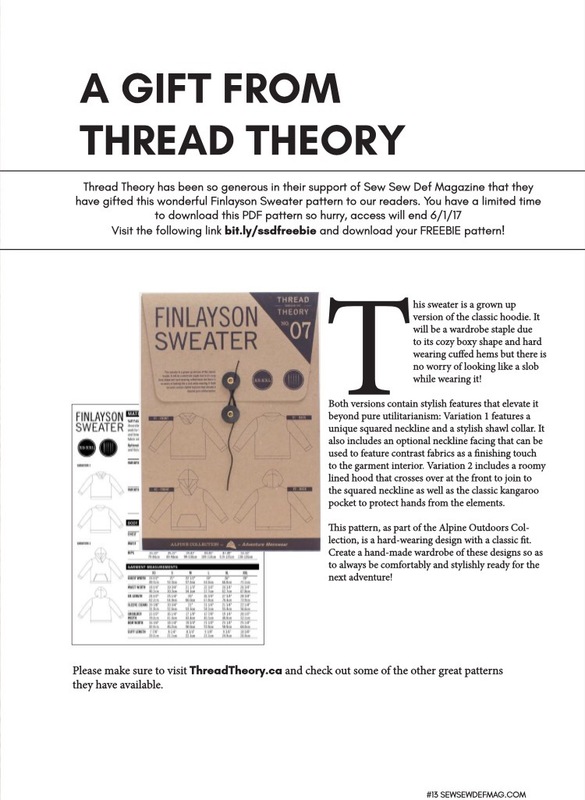 Did you see that issue two of SewSewDef Magazine has a free download* for the Thread Theory Finlayson sweater? …So, of course, the first thing I do is buy some black & white striped sweater jersey and make one up before I even know what’s happened! I made size xs with no modifications. 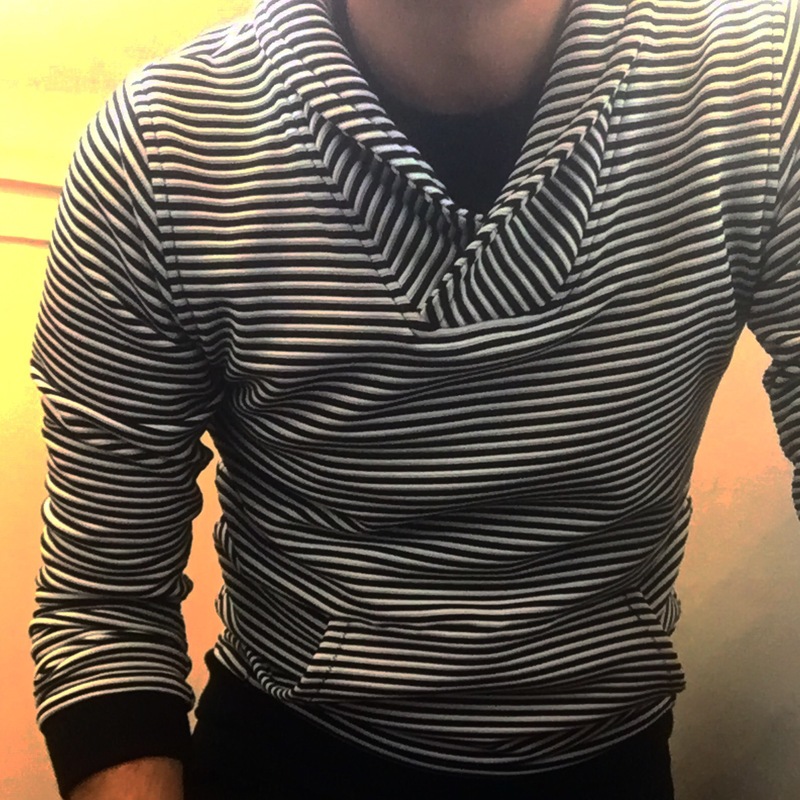 The fit is great, also I’ve never worn a shawl collar before … I love it, especially in this fabric, it’s got a bit of structure to it and sits well – I folded the fabric the other way (not selvedge to selvedge) for the collar and I really like the way the stripes work over it. I also chose the kangaroo pocket. For the next one I’m trying a woolly jersey knit. I’m not sure what it’s called, but it looks more like a jumper. It’s blue and has little flecks of colour over it. 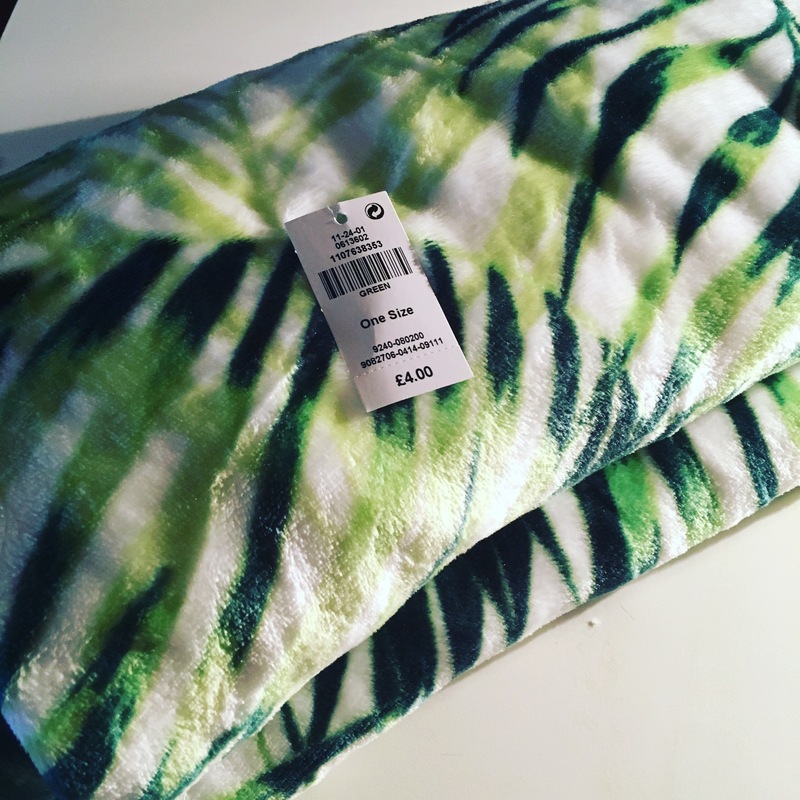 I bought it from a fabric shop called The Fabric Shop in Whitstable recently. I’ve gone up a size with the pattern this time to make it looser fitting, I kept the sleeve & body length the same as xs though. It’s a great pattern. The sizing is clear, check your measurements against the ‘finished garment measurements ‘ too though as this affected my overall choice. I’m really starting to notice the difference it makes to the fit and sizing when using fabrics with different stretch, drape and volume. Slowly, I’m starting to be able to understand and imagine how a fabric will behave… at last! Deviating from Finlayson but sticking with the MMMAY17 pledge for more non work clothes; I made a tshirt. 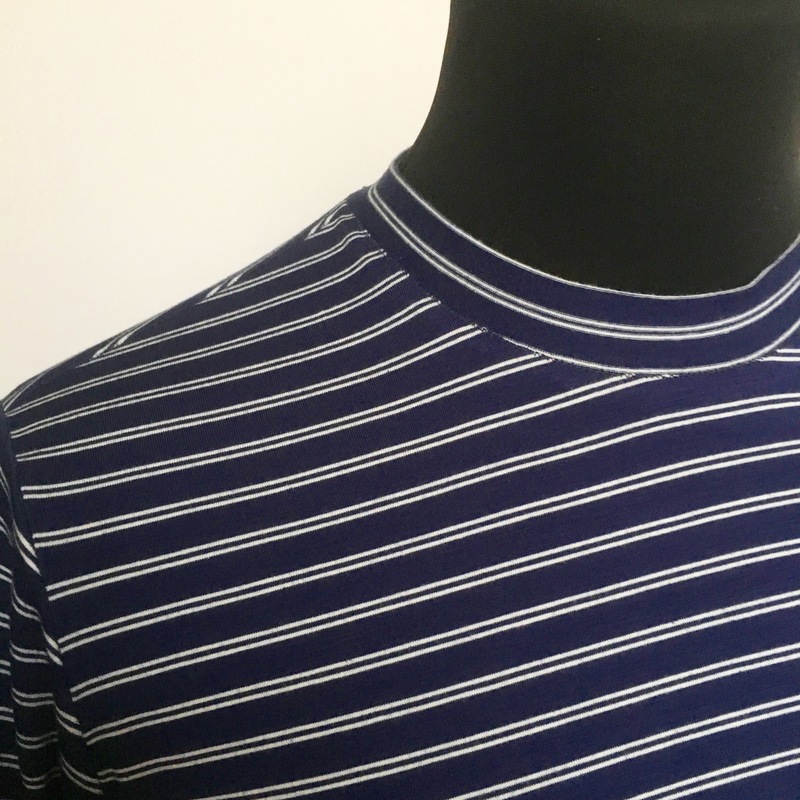 It’s the pattern from Men’s Clothes For All Seasons (the Japanese sewing book that I love and have made loads of patterns from!) and doesn’t really take much more than an hour from start to finish. You can’t really see in the picture, but a couple of the stripes match up at the chest. You can’t win ’em all, I guess. But the stripes on the shoulders are spot on! And to complete my pledge, I made a muslin for a Goldstream Peacoat, and wrote about my first impressions Here! 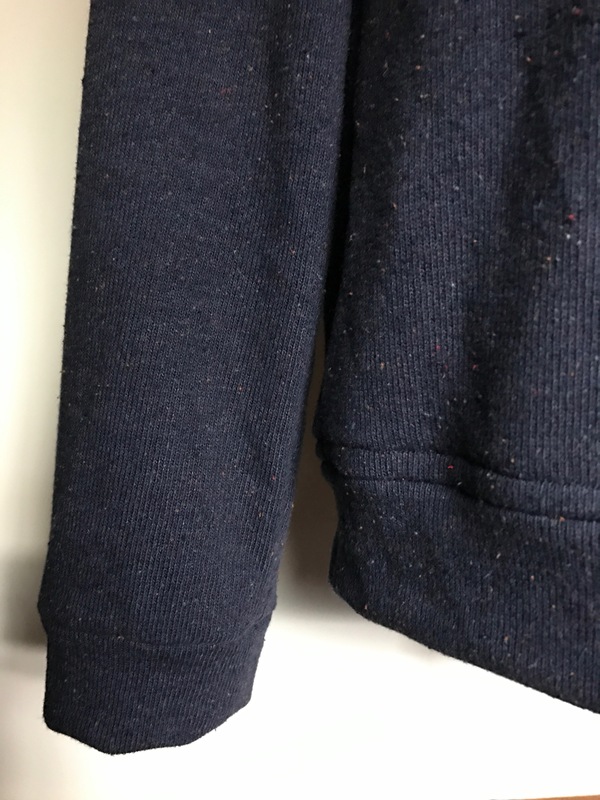 The fleece was quite slippery, so I sewed it up using lightening stitch and the walking foot before taking it to the overlocker. A lot of fluff was created in the making of this top… maybe a little too much for my overlocker to handle…? I’ve since bought some tape to sew over the inside seams, but I can’t quite bring myself to do it. 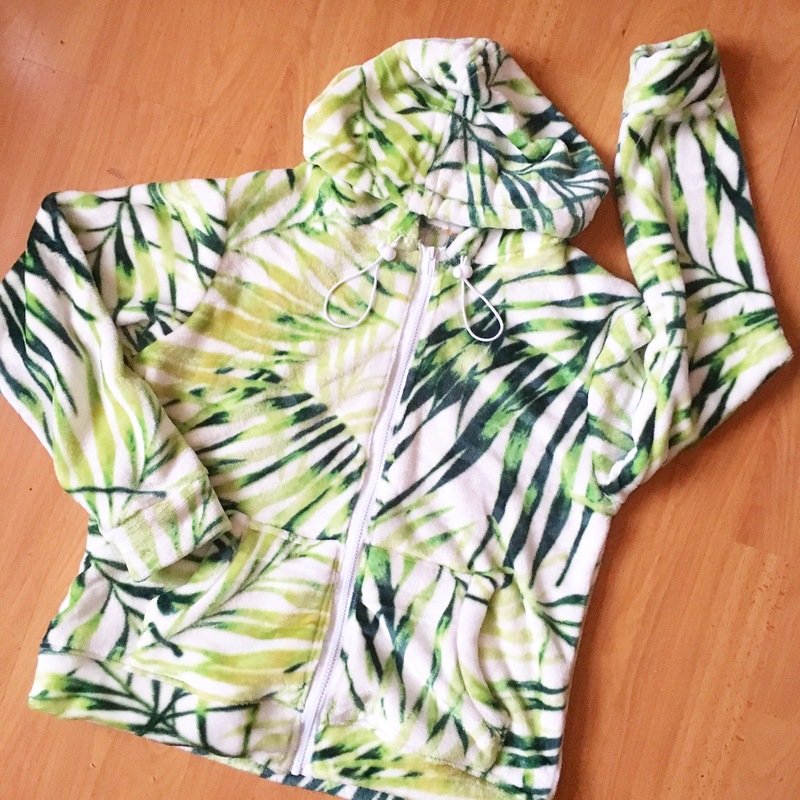 It should be hand sewn but I’d like to see if I could get away with machining it…? I’ll plan ahead next time. My sewing seems to be all over the place at the moment! How do you organise your sewing time? I need to learn the secrets! Wash & dry fabric as soon as you buy it. 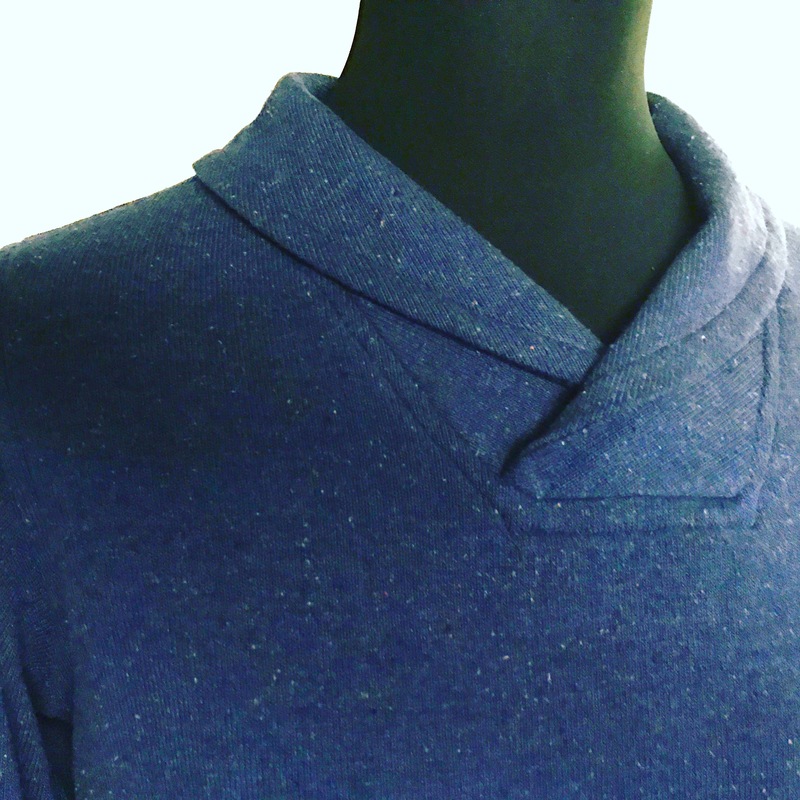 Keep an eye out for more of that jumper style fabric… find out what it’s called! Maybe try to batch-make some staples to save time… although that could take some of the fun out of it…? Next Next post: ﻿Snaps, Straps & Stitches! The striped sweater is top!